The Lexmark X950dhe is a large-format multifunction printer that offers A3 colour functionality and flexible print, scan, copy, and fax features, ideal for workgroups looking for quality and productivity. It enhances workflow, with its average print speeds of up to 45 ppm, while print quality is very professional, with maximum resolutions up to 2400 dpi. The Lexmark X950dhe A3 colour laser printer is capable of networking, making it easier to share over a group of users. It uses colour LED print technology, which offers quality results. However, the Lexmark X950dhe workgroup printer does not have memory card support, though it has an extra USB port for direct printing and scanning. 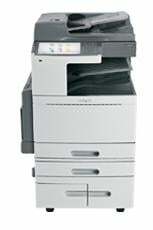 Built for heavy duty printing, scanning, copying, and faxing, the Lexmark X950dhe offers a maximum monthly cycle of up to 200,000 pages, though it is only recommended to use it for 33,000 pages per month to preserve its longevity. This printer is compact, but the addition of extra paper trays makes it significantly taller. The Lexmark X950dhe colour laser MFP has an automatic document feeder and a duplexer and still features a large touch screen LCD for quick menu access. The Lexmark X-950dhe printer also offers Ethernet connectivity, in addition to its high-speed USB interface. The Lexmark X950dhe all-in-one colour laser printer is speedier than previous Lexmark multifunctions. It can print as many as 45 colour or black and white pages in a minute, while copies come out at a rate of 40 cpm for colour A4 copies, and up to 45 cpm for black and white copies. The X950dhe laser printer can print on a wide variety of media, including A3 paper, ideal for large-format printing. The low-priced Lexmark X950dhe black toner cartridge is highly cost-effective with a print yield of approximately 38,000 pages although the cost of colour cartridges for the Lexmark X950dhe printer is considerably more. The Lexmark X-950dhe multifunction printer still does not support memory cards and it does not offer advanced fax functions. The device also lacks wireless capabilities, but it does offer convenient network connectivity.